We're so glad you took time to visit. 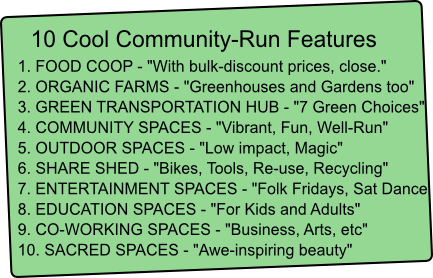 Are you interested in seeing a vibrant, healthy, large-scale eco-village / eco-town on the Colorado Front Range? Come on in! We're building a critical mass of empowered future villagers to trigger the building of that eco-town. We believe everything is here and ready to easily build this project. So what's holding it up? The "market" is not sure there's enough people who want green homes. Well, we've talked to 1000s of nice folks and many tell us that they agree that there is. Our goal is to build an "actionable" database of 2000 to 3000 pioneering folks. And we're growing it everyday. We were very inspired by the enthusiastic and supportive folks that stopped by at our booth at the Boulder Creek Festival - May 29th - May 31th (300,000 attendees)! 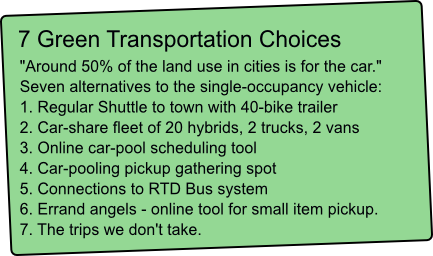 And a big thanks to all the cool bikers we met at the Boulder 360 city bike ride - June 6th at 3pm-7pm, Oil Disaster Rally, Cohousing Conference, Green Drinks, Boulder Green Streets, Rocky Mountain Sustainability Fair (30,000 attendees), Bioneers, Jan 15 Q&A, Denver Q&A, Thank you! At Bioneers, we joined Barrett Architects for a presentation at about large-scale eco-towns in Colorado. We also are excited to announce that we have partnered with one of Colorado's leading green and community-living design firms - Bryan Bowen Architects - for the formal project design. In August we won a spot in "Common Pitch" - a night of "social ventures" start-ups with judges Hunter Lovins, the CEO of Patagonia, and more. Wow, fun stuff. We got a spot on Fox News, met the Governor, got told to build it by the Mayor of Denver, and an article in the Boulder Weekly. 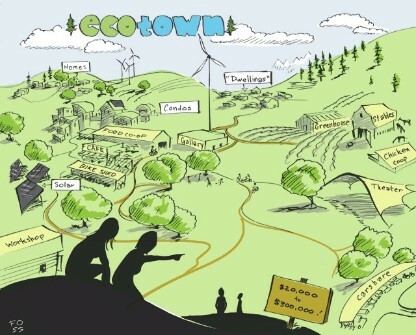 In May, we are putting plans together for an intimate, focused, and informative, open space "unconference" specifically on Eco Town. And there will be smaller events before then. See the facebook blog. 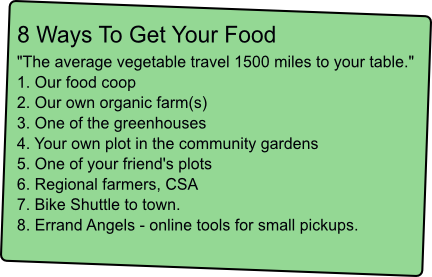 "300 homes wrapped around a village center, with a food coop, community spaces, entertainment spaces, two organic farms, community gardens, cars on the edge, a 30-car car-share program, share shed, shuttles to town, dance nights, bluegrass Fridays, cafe, grills, outdoor spaces, three cohousing 'very green' pods, a ring of smaller 'simple living' homes, and on the edge, low-impact hand-built alternative building projects..." Is this do-able in Colorado in 2012? Absolutely. Here is the vessel to make it happen. Above is the Facebook blog and fan page - Our database has a lot more people than those on the Facebook fan page, and you are not required to join the fan page to keep up to date. Nor do you need a facebook account to check the blog. It's actually more important is to get into the database.